The Wolves will play the Jazz on Wednesday without either Jimmy Butler or Jeff Teague. Teague has left knee soreness after banging knees with LeBron James in the Wolves’ victory over Los Angeles on Monday night. He is having further tests done on the knee this afternoon. A source told the Star Tribune that Butler's absence is part of a regularly scheduled rest, and he told ESPN's Rachel Nichols via text: "Because my body is hurting and I don't want to go out there and risk an injury, people make stuff up? What are they going to do when I show up and hoop on Friday?" Still, it’s hard not to view his absence as another step in the process of getting himself out of Minnesota. It will be the second game he’s missed; he didn’t accompany the Wolves to Dallas on Oct. 20, which was the back end of back-to-back games. In this case, the Wolves were off Tuesday and are playing the third of three consecutive home games. When asked about the ongoing trade drama with Butler, Jazz guard Ricky Rubio -- the subject of numerous trade rumors when he was with the Wolves before being dealt in 2017 to Utah -- said it's all a matter of perspective. Listen: Will Houston offer lead to a Jimmy Butler trade soon? Chris Hine and Michael Rand discuss Houston's reported offer of four first-round picks for Jimmy Butler, while also wondering if Miami will get back into the mix on a possible deal. The timing of Butler's absence is interesting given the parameters of a potential Butler trade with Houston. Brandon Knight and Marquese Chriss, two Rockets players acquired from Phoenix in late August, are eligible to have their salaries aggregated as part of a trade package starting Wednesday, per the rules of the NBA’s collective bargaining agreement. Their availability could help facilitate a deal with the Rockets – who last week reportedly offered both in a package along with four first-round picks in exchange for Butler – or spur other teams to increase their trade offers. 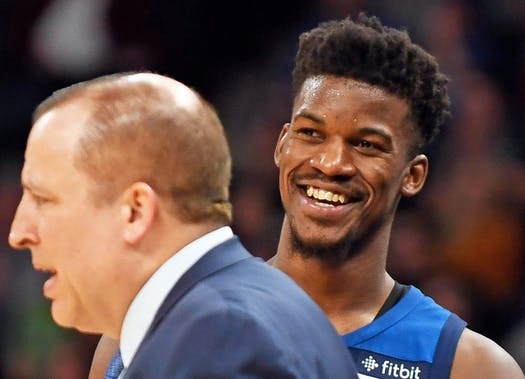 The Wolves are coming off a victory over the Lakers Monday in which Butler scored 32 points, making all five of his three-point attempts in the fourth quarter. Thibodeau said he hadn’t decided how to replace Butler and Teague in the starting lineup, but rookie Josh Okogie, Tyus Jones and Derrick Rose figure to get a lot of extra minutes. Teague missed some time last season with a similar injury to his right knee. This time it was the left knee. “I already had a little tendonitis,’’ said Teague, who indicated he’d know more about the extent of the injury – and how much time he might miss – after further tests this afternoon. Teague said he was frustrated at not being able to play. Given the similarity to the injury he had last season, he has only one solution: “I guess I have to start wearing knee pads,’’ he said. The good news following the Wolves’ morning shoot Wednesday was that Andrew Wiggins, who missed the last three games with a quad contusion, appears to be ready to make his return against Utah. *Also on Wednesday, a source confirmed the Timberwolves will not pick up the third-year option on 2017 first-round pick Justin Patton. The deadline for picking up the option is Wednesday night. Patton, chosen with the No. 16 pick as part of the draft-night deal for Butler, has had his career-to-date derailed by foot injuries. He has appeared in just one NBA game. He'll be an unrestricted free agent next summer. Will Halloween hold key for Butler-to-Houston deal?